NEW YORK, NY--(Marketwired - Mar 19, 2015) - Black Book, a leading provider of electronic data and insight to the automotive industry, announced today the completion of its transaction to acquire William Ward Publishing, the exclusive distributor of Canadian Black Book vehicle values. The favored valuation guide of financial institutions and dealers in Canada, Canadian Black Book is one of the most recognized and influential brands in the Canadian auto business. The announcement was made by Richard P. Malloch, president of Hearst Business Media, the group that includes Black Book. Terms of the deal were not disclosed. "We have a rich 55-year history serving the Canadian automobile marketplace with William Ward Publishing and we are delighted to welcome them into the fold," Malloch said. "Adding William Ward Publishing to our group furthers our ability to deliver essential vehicle pricing data and innovative delivery systems to our customers throughout North America." William Ward Publishing was founded in 1961 by Bill Ward. Ward established the company to distribute Canadian Black Book used vehicle values, which are based on actual Canadian market transactions. Since that time, the company has evolved from a distributor of printed guides to a technology company and recognized consumer brand. Kathy Ward, daughter of Bill Ward, will remain as executive chairman of the company and Brad Rome, currently vice president of sales and marketing, has been named president. All data collection and publishing will continue to be based on Canadian market transactional information gathered from multiple sources across Canada. "Kathy, Brad and their talented team will be strong additions to Black Book," said Tom Cross, president of Black Book. "I look forward to working with them even more closely to serve our customers and further accelerate the growth of our business." "Black Book is the perfect home for us and a natural fit," Ward said. "Today marks an exciting new era for our company and our customers -- we are delighted to join forces with a true leader in the auto industry." 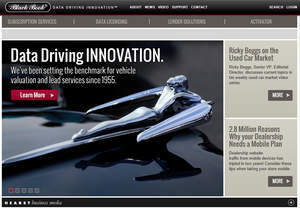 The Black Book family of vehicle appraisal guides, widely known in the automotive industry for providing timely, independent and accurate vehicle pricing data, is published daily by National Auto Research, a division of Hearst Business Media, and delivered through Data as a Service and Software as a Service applications. New and used car dealers, lenders, manufacturers, fleet remarketers, and government agencies have relied on Black Book since 1955. For more information visit www.blackbookauto.com. Best known for being the trusted source of vehicle values to the car industry for over 50 years, Canadian Black Book now offers three excellent value calculators -- Trade-in Value, Future Value and Average Asking Price. Car buyers can visit canadianblackbook.com and get unlimited access to the free calculators. Canadianblackbook.com databases values for every mainstream Canadian car and truck sold since 2002, as well as providing future values looking ahead up to 5 years. For more information visit www.CanadianBlackBook.com. The Black Book family of vehicle appraisal guides, widely known in the automotive industry for providing timely, independent and accurate vehicle pricing data, is published daily by National Auto Research, a division of Hearst Business Media.